Are Google Getting Social Wrong … Again? pushed front and center in Google’s redesign.There’s no doubt now that Google is betting on taking a big chunk of the social market. Google have tried to crack social with limited success – there are various theories why they haven’t had success to date. Whenever I see Google take a lumbering step forward, I start to think of a world where Google+ is the default place for social sharing. It’s a world that I increasingly worry about living in. If anything because they just “don’t get social” – they don’t seem to understand the importance of the building blocks required or the need for a collaborative attitude towards third party developers. We run a service to share Google+ public posts on Twitter and currently have 11,800 people actively using this feature. In order to send these posts to Twitter we check each person’s Google+ account around once per 30 mins. This makes 48 requests per day per account, so 566,400 total daily requests. Because we have some logic to check more active accounts more frequently, the actual number of requests we make daily is closer to 700,000. The problem? 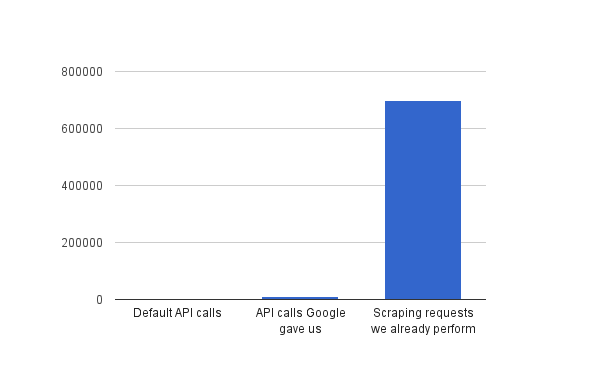 Google only allows you to make 1,000 requests per day via their API. We’ve requested an increase and were bumped up to 10,000 requests per day (more than a little shy of the 1,000,000 requests we asked for!). We then asked to be increased higher but have been told “further review of your application is necessary” and have been ignored for the past 40 days. The real crazy part is that since we’ve not been given enough API access for** Google+****, we’ve instead been making these 700,000 requests by scraping Google+ account pages. ** We have to download the entire account page (no doubt adding far more load than an API call would). We would love to use an official method, but we haven’t been allowed to! We obviously face a risk that Google will block us from scraping their pages, although we would think that this is unlikely given their entire search business is based on this practice and these 12,000 users need this service.Who is this 10,000 request limit designed for? What application can usefully scale with that kind of access? How does Google expect developers to build anything with such non-sensical restrictions? Compare this with Twitter where the API was released along with the private beta version of their product. The Twitter API has in face been a major contributing factor to twitter’s huge growth. Both twitter and Facebook allow for per access token limits, i.e. the more people who give your service access to their account, the more API calls you can make. It’s fair and it gives the security that businesses need when scaling.Google have always had difficultly in finding a place for third party businesses to sit in their ecosystems. While most other companies thrive on using enterprising developers to fill out holes in their products and finding new use cases for them via useful APIs, Google seem to prefer keeping all the momentum and risk in-house. Restrictive API licences & poor support have always made it a challenge to build any kind of business on a Google API. However, Google+ takes this to a whole new level. They only expose already public information, giving users no way to export or work with their private data. Google API limits are then the choke of death for any business that attempts to work with them at scale. So it is all fair and well that Google is integrating their Google+ service tighter into their UI but until they shift their thinking away from a less hierarchical philosophy to a more egalitarian approach where third party developers work alongside them – we still remain unconvinced that Google will ever succeed at social.